Jacob Ludwig Felix Mendelssohn-Bartholdy (1809-1847), German composer and conductor, was born into a privileged and intellectual Jewish Hamburg family who converted to Christianity (and added the Bartholdy) when he was 7. From a young age he had the opportunity to meet and be affected by the scientific and literary greats of German society through his family; and from a young age his genius was recognized. By his mid-teens he had written 13 string symphonies and an opera, and at seventeen wrote two of the pieces for which he is famous today – the overture to "A Midsummer Night's Dream" and the equally charming Octet. From the age of twenty he travelled extensively for the next 16 years (he was particularly welcome in England where he was a favourite of the royal family) before settling in Leipzig to found the conservatorium there and conduct the famous Gewandhaus orchestra. Other orchestral music include the early “string symphonies”, a number of concert overtures and incidental music for six plays; 2 piano concertos, and the violin concerto. He wrote over 70 songs, 12 duets and some concert arias. His chamber music includes a number of string quartets, piano quartets, 2 delightful piano trios, sonatas for clarinet, cello, viola and violin, and other works. He wrote for the organ and the piano - his “Songs without Words” are particular favourites. 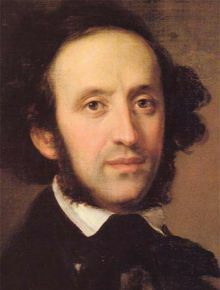 Mendelssohn has a prominent place in the history of conducting. He was one of the first to use the modern baton; and pioneered the use of a single conductor in choral woks. (Previously the conductor directed the choir, leaving the orchestra to the first violin.) He can also be given credit for his part in the resurrection of the music of J.S. Bach, which had been neglected for generations. Felix Mendelssohn died after a series of strokes in 4 November 1847, only months after the sudden death of his much loved sister, Fannie Mendelssohn-Bartholdy (Hensel) of an aneurysm. His ill-health in the final months of his life was exacerbated by his grief and almost certainly hastened his much too early death. This page was last modified on 11 July 2016, at 20:00.